Spring is a time of year that greatly inspires us. The days get longer and longer, the island is renewed and dressed in striking colours and everything around us starts to feel like a holiday. Although the privileged climate of the Canary Islands offers mild temperatures throughout the year, the changes in the landscape, and in the environment, are more evident than ever during this time of year. 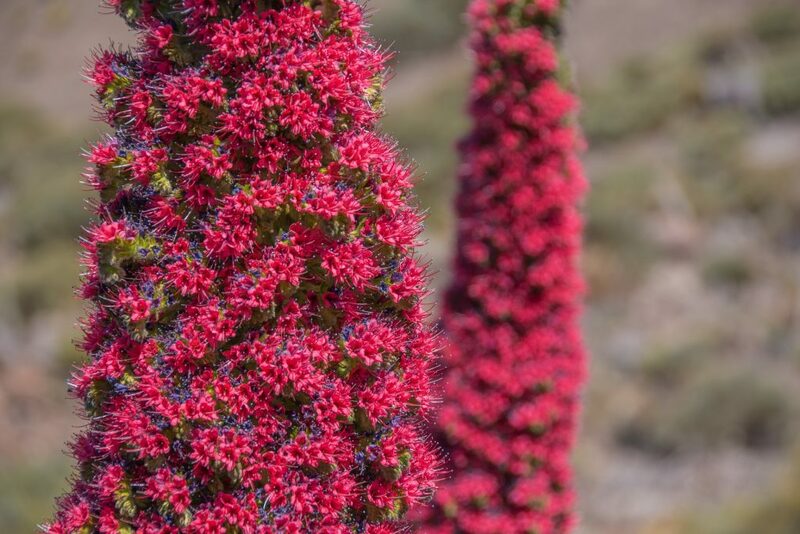 The question is: what does springtime in Tenerife offer to “the island of eternal spring”? At GF Victoria ***** GL we will share with you the best plans to take advantage of this season in this perfect scenario of Tenerife. Although our hotel has some ideal pools where you can take a dip every day of the year, many wait for this season to take their first swim in the ocean. The clean and refreshing waters of the Atlantic are perfect to combat the endless sun that accompanies us during these months. If you stay with us, we encourage you to try the beaches of Costa Adeje, located a few minutes walk from our hotel. The island offers many gardens with endemic species, but in Güímar we find a rare botanical area as peculiar as it is interesting. In order to promote knowledge about the many examples and to put aside the myths about poisonous plants, this space brings together a total of 70 species over 1,500 square meters. To the north of the island in Icod we find two of the best-known attractions of the Archipelago. First, we find the famous Millennium Dragon tree which presides over the municipality. Further on we discover the butterfly house that accompanies it. Would you like to know what it is like to walk among more than 800 exotic butterflies from all over the world? It is the perfect activity to share with children, allowing them to observe the most striking species, learn how they are born and evolve and, above all, it will inspire in them a passion for the animal world. Depending on the year, the Corpus Christi festival happens near to the beginning of Summer. It is a Spring event not to be missed. All over the island, we find the iconic carpets of flowers, sand and many materials that are placed on the streets in each municipality; but without a doubt, the most representative are those of La Orotava. In this stately northern town, a huge tapestry of coloured sand is prepared, which covers the entire Town Hall Square and attracts a crowd of curious people every year to admire the tenacity and creativity of those involved. Recommended. En Tenerife somos unos grandes aficionados a la música jazz, gran muestra de esto son los continuos festivales que se realizan en la isla. En el Hotel GF Victoria*****GL somos partidarios de la sostenibilidad y creemos que el plan que propone el Museo de la Naturaleza y el Hombre de Tenerife es perfecto para combinar naturaleza y la mejor música. Disfruta de imágenes que retratan paisajes de los 5 continentes y baila al ritmo de la multitud de conciertos programados para esta edición. In Tenerife we are great fans of jazz music, as shown by the regular festivals which take place on the island. At GF Victoria *****GL, we are supporters of sustainability and we believe that the events proposed by the Museum of Nature and Man, Tenerife, are perfect to combine nature with this music. Enjoy images that portray landscapes from the 5 continents and dance to the rhythm at the multitude of concerts scheduled for this season. There are no excuses, the coldest period on the highest peak in Spain is over and the climb up this volcano is an experience that you must live at least once. Indeed, it is not easy and when you climb to 3,718 meters you will notice the lack of oxygen; but being able to view the seven islands of the Archipelago is a unique experience. There is nothing like spring to try new challenges. Tenerife has five denominations of origin and, among its wines, red wines stand out as the iconic brand of the island. However, there are ever more fans of the fruitier wines of the Abona region and the Güímar Valley to the south of the island. Their wines are easy, with a fresh taste on the palate and with a multitude of nuance, ideal to drink with a good cheese or to accompany a fish dish. Dare to visit the wineries of the area and do not miss tasting the sweet and sparkling wines, they will surprise you! This entry was posted in Actividades, Ocio. Bookmark the permalink.